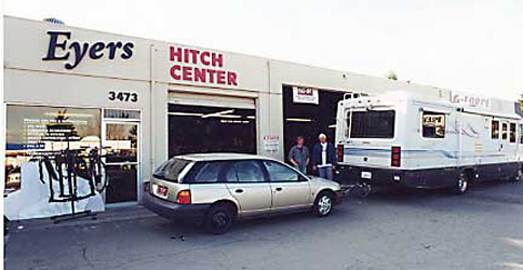 Trailer Hitches - Eyers Hitch Center Inc., the Trailer Hitch Experts, located in Santa Clara CA. Eyers Trailer Hitch Center Inc. I'd like to introduce you to our family-owned and operated business - and provide you with important safety information on all aspects of towing. My name is Cecil Eyers. I, along with my son Eric, have owned and operated Eyers Hitch Center Inc., since 1967. We are known as the "Trailer Hitch Experts" in our local area because we've been around for such a long time doing quality installation of trailer hitches and towing accessories. Our number one concern is the safety of our towing customers. We realize that since we are a local business, we cannot provide personal service to everyone who finds us here, so we've packed a great deal of information on this website to help you learn all about the joys of towing safely. Inexperienced or ignorant towing can take your life or the lives of others in one swift cruel stroke. In my business, it’s not just quality parts and installation that make for safe towing. It also requires knowledge and practice. I hope to give you the knowledge you need to keep you safe in the articles on this website, but you must take this information and apply it to your own towing situation. I've seen some towing accidents that would make your hair stand on end. I’ve had highway patrol officers, (customers of mine), tell me about gruesome towing accidents they’ve had to investigate. The tragic part of these terrible accidents is that with the proper training and hitch equipment or safety accessories, many of these horrific scenes should have been avoided. 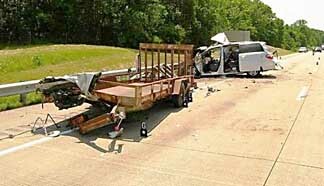 Towing safety is the responsibility of every person who hitches up and tows. It’s my responsibility to make sure my customers are "hitched safely". But I feel strongly about your towing safety - and if you are not living the the Santa Clara (Silicon Valley) area of California, where we can provide the expert installation and advice you need, hopefully reading the information on this website will help. Use a tow vehicle that is large enough for your trailer and has the needed power and appropriate towing equipment package (heavy-duty radiator, transmission, suspension, wheels and tires). The tow vehicle must be rated by its manufacturer both to tow the gross weight and to carry the tongue weight of the fully loaded trailer. Weigh your loaded trailer. Improper loading can lead to axle and frame damage, and can lead to loss of towing stability and control. A competent hitch installer MUST perform installation of the hitch, sway control, and brake control equipment. Make sure the installation follows the tow vehicle and hitch manufacturer’s instructions. Use a brake controller unit that automatically applies the brakes in proportion to the tow vehicle brakes and also has a hand control for applying the trailer brakes only. Inflate all 4 tires of the tow vehicle AND the trailer tires to their maximum cold pressure. See the maximum pressure rating on the tire sidewalls. Use outside mirrors installed and adjusted to allow a clear view of the area along both sides of and behind the trailer. Locate them as close as possible to the driver to provide the maximum field of view. Practice turning, braking, parking, backing up and hitching in an empty parking lot until you get the feel of your rig. Learn what to do in emergency driving situations that may occur while towing. Towing Definitions: "Hitch Jargon" explained. All about Towing Safety: including Highway Towing Safety, Off Road Towing Safety and Trailer Weight Safety. All about the different types of Trailer Hitches and special equipment, including information about the Trailer Hitch Accessories you need in order to safely tow your trailer. Tips and Techniques to master all the necessary skills involved in safely towing trailers. And we’ve included a Safety and Equipment Checklist that will come in handy as you prepare for your trip. Please read all the articles on this website and take our tips and suggestions seriously. Even if you are a towing veteran, you just might learn something new and useful to make your travel even safer for you, your family and friends, and for all the others who share the road with you. Remember, if you tow without the proper towing equipment and knowledge, you are a danger to yourself and to others on the road. Here at Eyers Hitch Center, Inc., we install only the best quality hitch systems and accessories, and you can trust our knowledge and experience to get you safely on the road. We carry many hitches in stock, so there’s no waiting on many installations. Our installers are expertly trained and we service ALL types of vehicles, from cars, vans and trucks to sport utility vehicles and big rigs. We also offer trailer brake and electrical wiring repair if something goes wrong with your trailer. Eyers Hitch Center specializes in custom installations and difficult jobs. When our competitors can’t do a job, they send their customers to us! Pintles, Adjustable Ball Mounts, Trailer Hitch Adapters etc. Trailer Repairs - Brakes & Lights, Frames, Couplers etc. Towbars and Accessories - Roadmaster, Blue Ox etc. We are conveniently located at 3473 El Camino Real in Santa Clara CA, one block east of Lawrence Expwy. Click Here for Map. We are happy to help any visitors to our Shop, but most of our customers come from surrounding cities like Santa Clara, San Jose, Sunnyvale, Cupertino, Los Gatos, Monte Sereno, Saratoga, Campbell, Milpitas, Fremont, Morgan Hill, Gilroy, Palo Alto, Mountain View, Redwood City, Santa Cruz, Atherton, and Los Altos. So please give us a call if you need a quote on installing a trailer hitch or if you have any questions about towing!